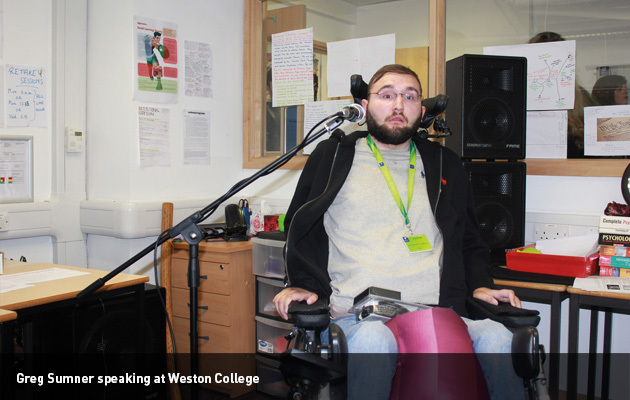 A man who was left paralysed from the neck down in a car crash which killed two men recently visited Weston College to warn students about the dangers of drink-driving. Greg Sumner was paralysed after he got into a car with a drink-driver four years ago, during an attempt to overtake on the brow of a hill. The car smashed head on into another vehicle and killed both drivers. Mr Sumner, who was a working 22-year-old at the time, broke 27 bones while his heart stopped four times. He is now paralysed from the neck down and needs round-the-clock care. He told Weston College sixth form students: “I might be the extreme of what’s possible but I had been told so many times that I shouldn’t get in a car with a drink-driver, and I still thought I would be okay. “Two people dead instantly, two fathers died instantly, four children were left without a father, all down to drink-driving.